theMALC: Instructor Or Life Coach? – Teach Principles! All of this was done while maintaining my 40 hour per week "real job" as a Health, Safety, & Fleet manager, sustaining my other daily practices, and training in Kenpo a minimum of 2 to 3 hours per week. I make no excuses! I am back on track with writing and this article actually comes out of my most recent Life Coach training. One of my hypnotherapy mentors, Peter Woodbury, MSW a trainer for A.R.E. Life Coaching, asked me, So, why life coaching, Dennis? 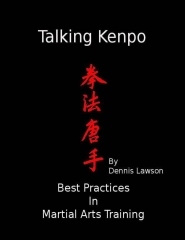 My immediate answer, with little conscious thought, was "Hell, Peter, I've taught Kenpo for over 30 years, I've been life coaching most of my career!" We shared a laugh. Peter has also been involved in the Martial Arts for a long time. My answer forced me, once again, to reflect on the ever-changing Martial Arts scene and my experiences with it. Martial Arts instructors need to have solid technical ability and good teaching skills. But, during my years as an instructor, I've also been asked to help students as they were: getting married, getting divorced, going to graduate school, having babies, dealing with cancer, and coming back from war. Somehow, learning the required studio curriculum didn't prepare me for THAT PART of my role as instructor! As advanced teachers and professors of the Marital Arts many of us have dealt with similar challenges from our students. In the past, and perhaps in your studio now, a Martial Arts teacher was a trusted mentor, someone a student could confide in. My question? Are we preparing our students, the next generation of instructors, for the, not so technical, questions their students might be asking them? How do we help these new instructors build the necessary skills to be able to help when their students need it most? .For example: A student comes to you with a financial issue. Sword of Destruction or Attacking Mace won’t save him from this attack, but Margin for Error will! .Using this principle as a starting point you can coach the student to develop a better budget, create an emergency fund, and, who knows, by applying this principle, he may be able to pay his studio dues next month. An instructor may be called on to work with a couple having issues in their marriage. By suggesting the couple apply the Three Points of View, they may begin to develop a more unbiased perspective on their issues (see definitions). The Third Point of View - a position of objectivity is a necessity for any instructor, or spouse, to remain emotionally “neutral” during a heated conflict. These two examples come directly from my personal experiences as a young instructor while teaching in New Orleans. Finally, as Martial Arts instructors we must understand the importance of the environment we create in our studios. It’s a principle of psychology that social interactions can influence cognitive, as well as, personal development (Vygotsky). By emphasizing principles, the universal truths contained in or Art, we focus first on our student’s personal development. Then, we can move on to the specifics of Basics, Forms, and Freestyle.